› Blogs ›	Furman Library News ›Is your FU upside down? The Chinese character 福, fu (pronounced “foo”), means ‘good fortune.’ A popular custom during Chinese New Year is to hang the character upside down as a play on words. The word for “upside down” is a homophone of “to arrive” in nearly all forms of Chinese. This pun means that good fortune is arriving! One of the most important holidays of the year, the lunar calendar celebration goes by many names such as Lunar New Year, Chinese New Year, or the Spring Festival. This year’s celebration will commence on February 5, ringing in the Year of the Pig! The festivities span fifteen days and culminate with the Lantern Festival on the first full moon of the new year, February 19. Visit the James B. Duke Library’s display to spin the wheel and receive a New Year greeting. 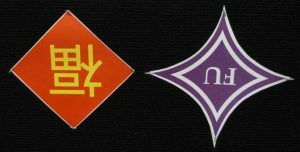 › Blogs › Furman Library News › Is your FU upside down?